Event Description: Your Dr. Clue corporate teambuilding event takes place on and around the Third Street Promenade, an open-air, pedestrian-only shopping and entertainment area that runs from Wilshire to Broadway. You can find everything here—boutiques, restaurants, history, public art…and a Dr. Clue treasure hunt! Location History: Founded in 1875 by an Army colonel and a California senator, Santa Monica is known today for its lovely beaches, its famous pier, and its very Southern California vibe. From its 1920’s heyday, when Hollywood stars like Will Rogers, Greta Garbo, Marion Davies, and Norma Talmadge built lavish mansions along its shores, to the modern-day city of fine cuisine, refurbished parks, public areas, and glamorous shops, Santa Monica has always been a trend setter. 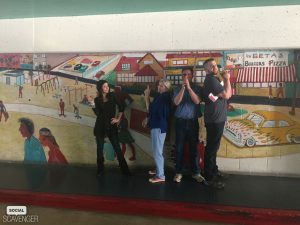 During your corporate teambuilding treasure hunt… expect to encounter puppet shops and magic shops; an old theater; a memorial to one of LA’s first saloons, and much, much more.